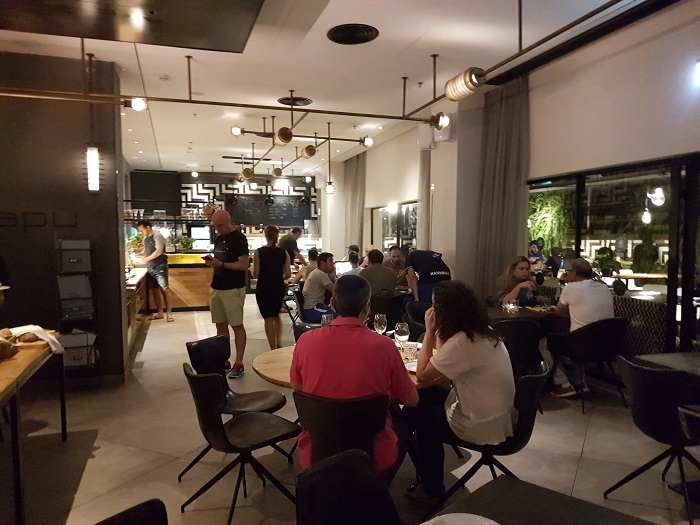 Mapu Restaurant by Chef Nir Zook in Tel Aviv is a Kosher meat restaurant where Nir Zook proves that kosher can be creative and tasty. Each course has his signature, a taste you won’t forget quickly. 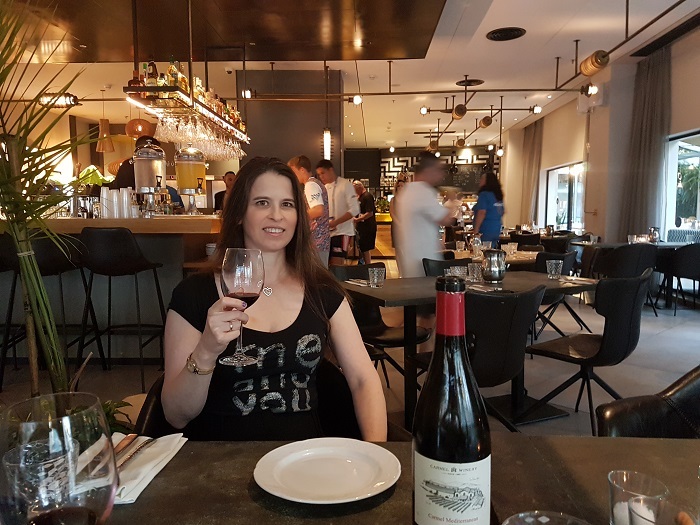 Nir Zook is one of the well-known chefs in Israel. He became famous of his kitchen creativity and novelty. 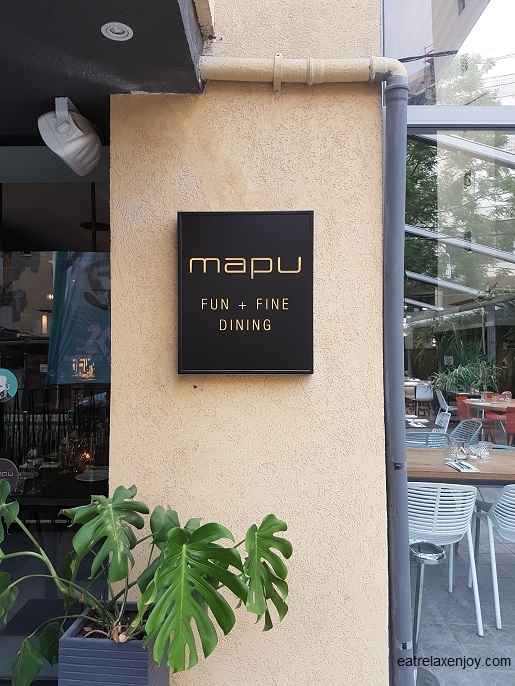 Mapu Restaurant, branded Fun + Fine Dining is his only restaurant now. 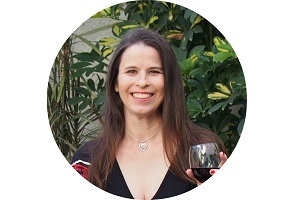 Nir also do culinary consulting and offers catering services, including chef meals he cooks at his home. 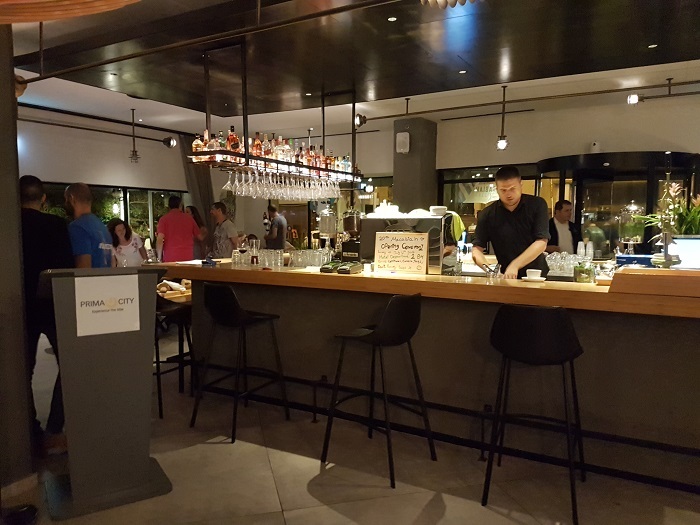 Map Restaurant has a Mediterranean, urban Tel Aviv style. Décor is modern with black and white colors. The hotel merges with the lobby of the hotel, as the restaurant’s bar is also the hotel’s bar. We came to Mapu to a tasting dinner; Nir picked the food for us, based on our taste. 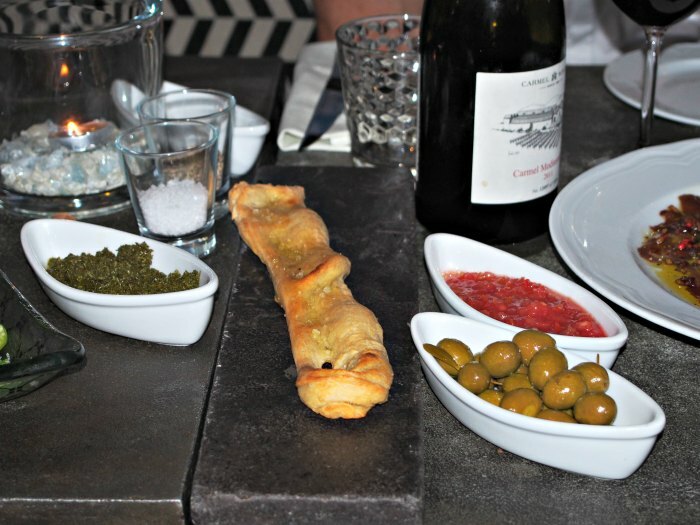 Focaccia + Olives – long crunchy Focaccia served with olives and two dips – tomato horse radish and grape leaves spread. The dips were surprising and so tasty. We never had something like this, a say we found ourselves repeating during the evening, as the ingredients and courses are quite extraordinary. 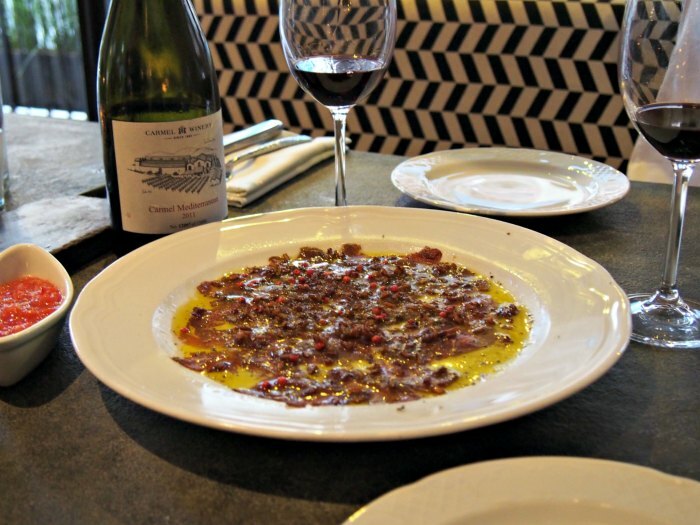 Beef Carpaccio – very thin and exact Carpaccio that melts in the mouse, interesting seasoning dotted with slight spiciness, excellent! Mapu Style Chopped Salad + Tahini and Eggplant Cream – Nir’s favorite salad. 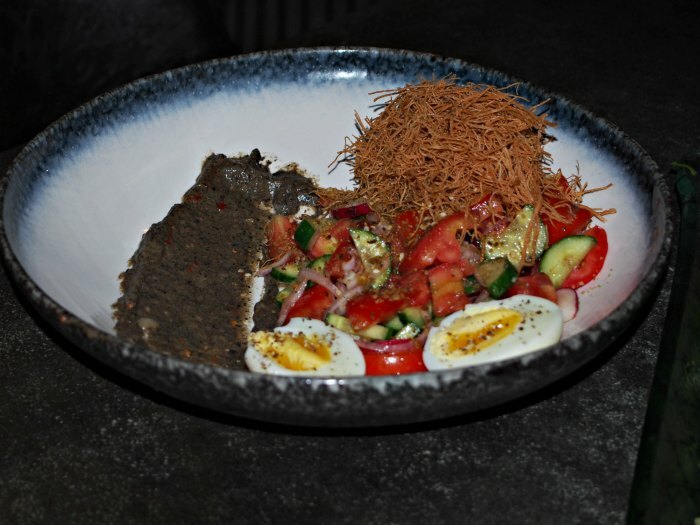 Coarsely cut vegetables served with soft boiled egg, a pile of kadaif noodles and crème of eggplant on its shell with Tahini (the shell makes it black). The crunchiness of the kadaif is so refreshing! 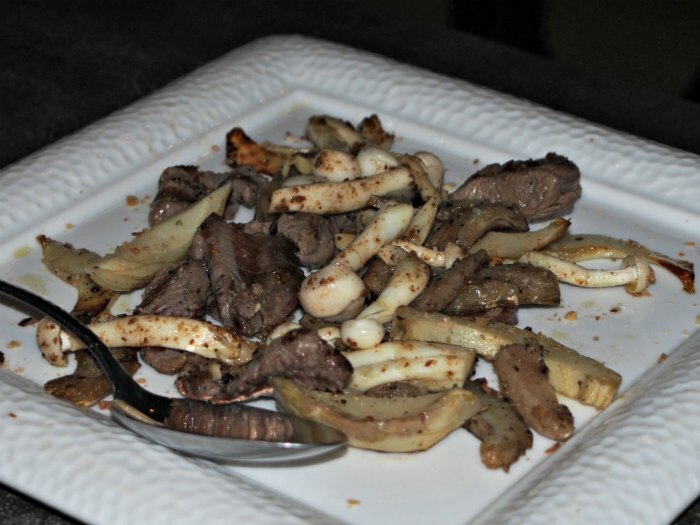 Veal Regalo + Marzipan – this is an especially surprising dish! A large amount of ground beef wrapped in Philo dough, covered with marzipan and Hibiscus water. The combination of tastes here is fantastic – to die for! Gentle sweetness that when I think about it I want to come to Mapu again and order it! 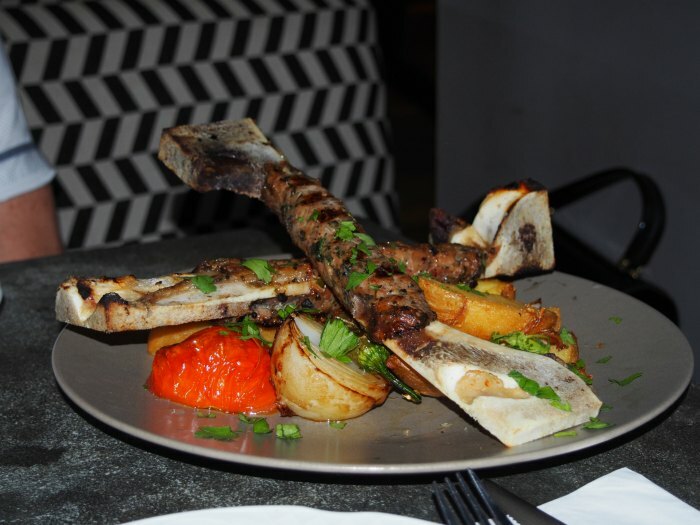 Prime Kebab + Grilled Vegetables – a very impressive presentation of Kebab. It was wrapped around beef bones. Very seasoned and somewhat salty (that’s expected). Served with grilled tomatoes and onions and potatoes that were made in three stages, including boiling, baking and frying. The result was soft inside but not mushy and very crunchy from the outside. They weren’t too greasy thanks to the exact temperature and time of frying. 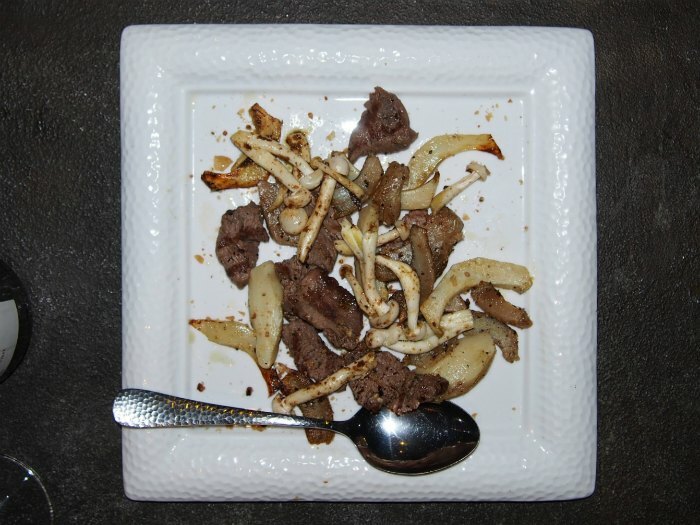 Fillenion + Artichoke – a rather small plate of melting beef fillet with artichoke and mushrooms; interesting seasoning with some Chili powder but not too spicy. 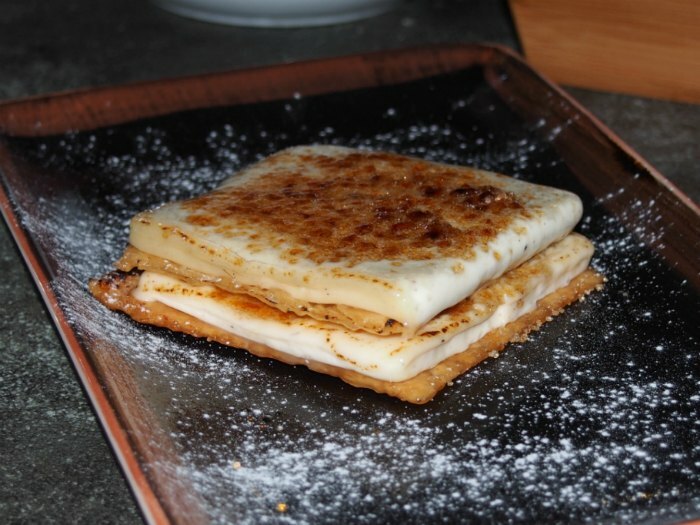 Crème Brulee – a combination of mille-feuille and crème brulee. Layers of thin puff pastry with layers of vanilla cream, scorched on the top. Fantastic, I could hardly believe it is Parve! With the food we had a really good wine - a local blend called Carmel Mediterranean 2011. Although the plates did not always exactly matched their description, they were always tasty and special. To Mapu you don’t come to eat what you are used to, you come to try out new things, interesting combinations. 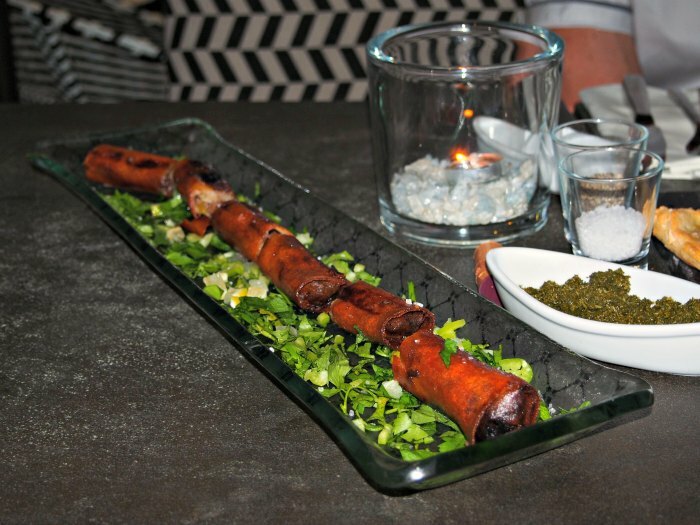 When you come to Mapu by Chef Nir Zook, you come to eat Nir’s food – creative and daring! It is an experience!